First you want to get your grill going! For pizza you want the grill to be nice and hot, anywhere between 500 and 600 degrees is ideal, and plan for the whole grill to be set-up for direct heat. While the grill is heating up, prepare you veggies for the grill. Drizzle the zucchini, summer squash and red pepper with olive oil, salt and pepper. Set aside. Place the garlic into a piece of tin foil, sprinkle with a pinch of salt and a small drizzle of olive oil, wrap this up tightly like a little package. Next take the veggies and garlic package to the grill. As the temperature is creeping up around 400 F, place the veggies and the garlic directly onto the grill grates and cover the grill. After 2 minutes flip the veggies and cook for another 2 minutes. You are looking for the veggies to soften just a bit and to have some nice grill marks. After cooking for 2 minutes on the second side, remove the veggies and the garlic package from the grill and cover it once again, keeping in the heat for the pizza! While the grill continues to heat, prepare your toppings and the dough for the pizza. First, slice the zucchini and summer squash into 1/4-inch half moons and slice the red pepper into thin julienne style strips. Set the vegetables up in small dishes or on a cutting board that fits next to your grill so you can easily reach them when it comes time to top the pizza. Do the same with both the mozzarella and the oregano. Next take 1/4 of the pizza dough and roll it out into an artistic looking disc. Take the pizza dough and the toppings over to the grill and get ready to put it all together. Brush the top of the pizza dough with olive oil and place the dough directly onto the grill grate, olive oil side down. Keeping the grill uncovered, brush the top of the dough with a bit of olive while the bottom side of the crust is cooking. After about 3 minutes, using a long set of tongs, flip the dough. With the cooked side facing up, top it with one fourth of each of the ingredients, working in this order: mozzarella, oregano, zucchini, summer squash, and red peppers. Once the pizza has been topped, cover the grill and bake the pizza for 6-8 minutes. You will want to peek in on it here and there to make sure that the dough isn't burning or falling through the grates! 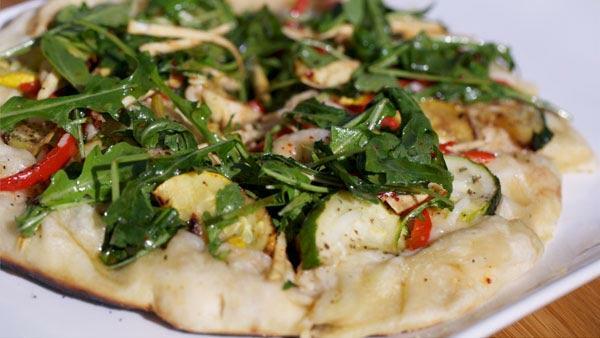 While the pizza is cooking prepare your Arugula and Artichoke Salad. For the salad, first breakdown a whole fresh artichoke, until you get to the heart. Slice the heart in half from top to bottom, then, using a mandolin or a very sharp chef's knife, slice the artichoke into super thin strips. Toss the artichoke strips and baby arugula together in a bowl with salt, pepper, red pepper flakes (you decide how much spice you want! ), olive oil and the juice from half a lemon. Taste and add a bit more salt, pepper, or lemon juice if needed. When the pizza is cooked through, slide it onto a cutting board or pizza peel and let it cool for 2 to 3 minutes. When you are ready to serve cover the pizza with 1/4 of the Arugula and Artichoke Salad, drizzle with a bit of olive oil and balsamic vinegar, slice into four triangles and eat!